Not to worry, they do try and accommodate their guests. There’s free computer time and internet in every room. And when you’re not lounging around the hostel, you can partake of a number of activities VE has planned for you. 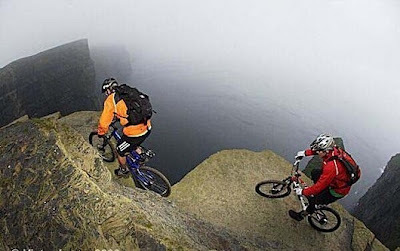 VE, believe it or not; I've seen a worse loo...got dizzy just looking at the hiking and biking "trails"( yikes! ). That last shot of the surfer shark tho'; way cool! But what about transport? Dude! Turn around! There's a shark out there!! I obviously need more coffee before I go out and drive. That hiking getaway looks interesting. What kind of special rates are you offering? And here I planned our trip to Denmark all by myself, when I could have had your travel expertise. You are now free to roam about the country and, potentially, die a horrible, horrible death. That's a great shot of the surfer! I think my surfboard would need sides. Like maybe the size of a cruise ship. I've used a couple of those photos myself, you know. Good stuff. VE, you know the motel is just a Motel6 right. Stayed there once, well actually checked in.... and right back out! i don't know...with all your misadventures, i'd likely get myself killed if you were my guide. i think i'll pass. but maybe one of the gnomes knows of a good vacation destination. VE? Thanks, but no thanks. VE doesn't always bring good things to life! Jeebus. I have seen Frat Houses with nicer bathrooms! subtorp77 - I have to. There was a squatter in Malaysia that was simply a hole in the floor. There was no TP at all...the walls were full of excrement from people wiping it on their with their hands. I walked in, took one look, and walked out. I never ate a thing for like 24 hours after that either. I really didn't need to see that bathroom picture this early in the morning. hit40 - Who needs a surf board when you can just ride a huge shark? kurt - I suspected as much. I seem to remember the bike one. starrlight - And that is saying something! megan - Just pretend you didn't see it. 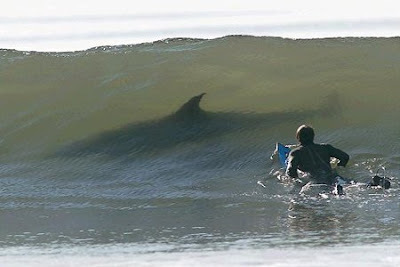 Focus on the big shark instead. There, don't you feel better now? 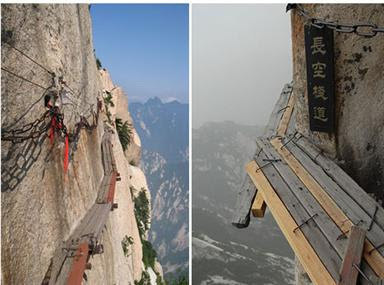 I'm a little concerned about the lodging and those hiking/biking trails did not look ADA compliant. I'm glad there is a petting zoo in the water. That is just too cool. @Quirkyloon, rimshot! Good one there-LOL! Erm, no thanks, I like a flushing loo and a chocolate on my pillow! bonnie - I thought perhaps "Go back"
subtorp77 - Ah, sounds like maybe you have some stories from Peru too. Actually, I really liked Peru...just not Lima. Being that I spent all week in D.C. I can really relate to all of those photos. Thanks, but I don't think I'm leaving the country again for a long long time! And that shark picture is going to give me nightmares! The Traveling Gnomes didn't do their job and scout this out did they? The gnomes are slipping. That surfer better not Hang 10. He'll only come home with 2.
subtorp77 - Yeah, I took a trip to Machu Picchu a few years ago. VE, first thing we saw upon arrival to Peru( now remember I was in the Navy at the time ); the harbour was filled with bombed out ships( bombs provided by the...ahem...Red Menace, as it was known at that time ) The loos that were holes in the walls ( literally ), were the cleaner ones!!! Anyway, do we get a banana boat for transport or what? .........The Sydney Opera House? The Hanging Gardens of Babylon? Herds of wilderbeest sweeping majestically . . .?" My legs got all giggly just looking at those hiking trails! I should have let you book my trip then maybe we wouldn't have had a "close call" on the runway. Is that bathroom cleaner on the edge of the tub? That bathroom will give me nightmares for sure. Suddenly I feel the need to clean my bathroom. And to avoid hiking, surfing, and biking. 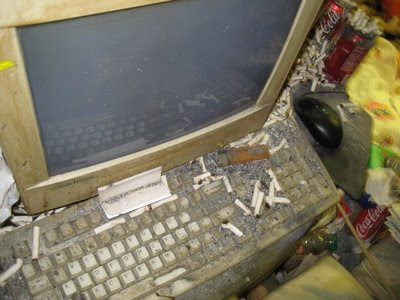 Gosh VE, I asked you when I sent you the pictures of my bathroom and computer to not post them on your site, but you just had to go and do it. See if I send you anymore pictures of them, and after all the cleaning I had done before I took those shots. 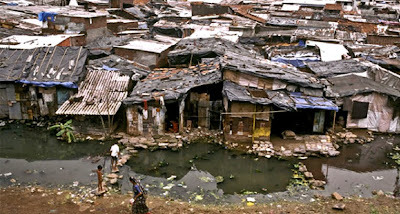 But you know the sad thing is that you can go to countries where people live in those little shantytown houses. I remember seeing many of those types of shacks when we lived in Panama and all you can do is think how sad that people have to live like that. And I have been to many gas stations and seen bathrooms that are not much better than the one in the picture. I think that you have seen some things that many of us are very lucky to have never seen. You have traveled to many places that I think I would never want to visit. Have you ever thought about writing a book about your visits? I think that it would be a great book because only you would be able to spoof a really sad place and make it fun. Or you could write the tourism guides for them, I bet their tourism increases. mrsupole - I'm working on a book. But I sort of go sidetracked by writing a different book...a fiction novel with suspence and mystery. I have no idea why; it is just sort of writing itself through me. I'm into it over 100 pages already. holy crap, a staycation never looked so good.